When the South Koreans target the German benchmark. 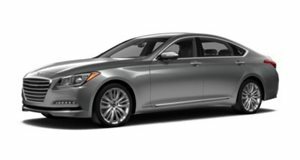 Later this month, Hyundai’s new luxury sport brand, Genesis, will reveal what’s perhaps its most important model so far, the BMW 3 Series fighting G70. Fortunately, we no longer have to wait to catch a good glimpse of what the final product looks like. Thanks to these leaked images, courtesy of koreanbeast.com and a sharp eyed Twitter user, these are photos of very lightly covered G70s being transported on a truck, likely to the official reveal event venue. The completely uncovered G70 appears to be at a commercial shoot. The G70 will join its two big brothers, the relatively conservative G80 and G90. But it’s the G70 that’s getting us excited. It shares the same platform as the also new Kia Stinger, meaning it’s rear-wheel-drive with track-tuning. Power could come from the Stinger’s 2.0-liter turbo four with 255 hp or an optional 3.3-liter twin-turbo V6 with 365 hp. It’s also entirely possible Genesis upped the power output in order to somewhat differentiate it even further from its Kia cousin. Styling wise, compared to the Stinger, the G70 actually looks a bit sportier. Note the large alloy wheels complete with Brembo brake calipers and large dual exhausts. There’s also a brief, but revealing enough, G70 interior photo. We’re digging that diamond pattern stitching, sport steering wheel, aluminum paddle shifters, and premium design. Genesis could potentially have a winner on its hands, and we wouldn’t be entirely surprised to see the G70 beat the 3 Series in a head-to-head matchup. 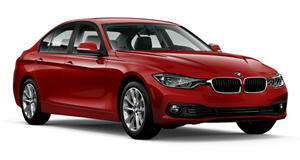 However, the 3 Series itself is almost due for a complete redesign, and BMW isn’t about to let anyone take away its benchmark status in this segment.